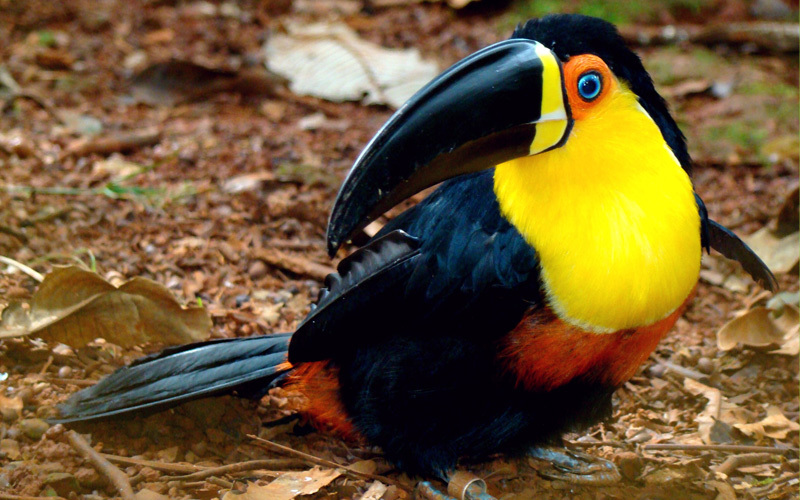 The Channel-Billed Toucan is brightly marked and has a huge bill. Often found in forests and woodlands, Channel-Billed Toucans prefer humid regions and are found in Trinidad and in tropical South America as far south as southern Brazil and central Bolivia. This species is an arboreal fruit-eater but will also take insects, small reptiles, eggs and frogs. At Hope Zoo, members of the toucan family are thriving on a diet of high-quality, low-iron pellets and fresh fruits. Pellets make up about 50 per cent of their diet – the other half being fresh fruits. They are fed plenty of fresh fruits, such as papayas (these in particular are amongst their favourites), melons, berries, grapes, apples and bananas.